This bursting series has got legs...maybe I could follow the Star Wars model and do prequels, sequels and bursting franchises? 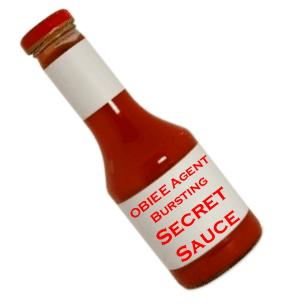 In the final part of the agent bursting series we will piece all of this together using a batch script. 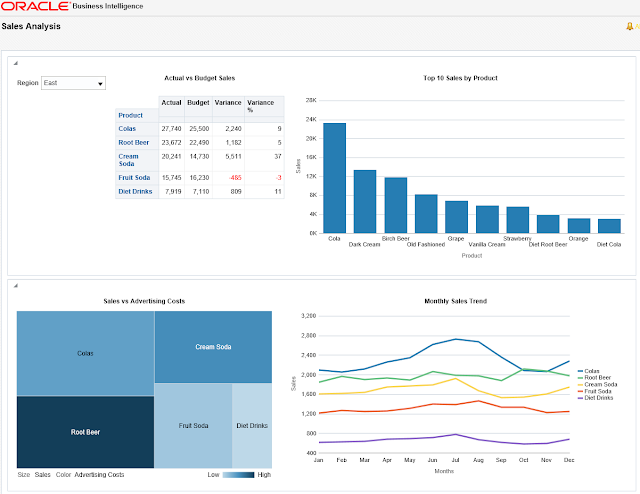 Remember in Bursting using OBIEE Agents Part 1 our Sales dashboard was filtered by a default region session variable (defined in an SQL table)? Here is the secret sauce: will use a batch script to modify the default region in the SQL table and then run the dashboard agent for each region. Launch the busting definition agent and write all our bursting regions to Region_Definition.txt. Create a temporary SQL script to update Default_Region SQL column for our "burster" user. Loop round to 2nd line of Region_Definition.txt and repeat. Got that? Too messy for you? I did warn you that it wasn't elegant. Batch scripting language of your choice. Oracle or SQL client in order to run sqlplus/sqlcmd from the command line. In my example I am using Windows 2012 and SQL Server <gasp!> and my scripting language will use the windows command. Unlike me, I recommend that you step out of the 1990s and use a more up-to-date language! The first issue we have is that the SaSchinvoke.exe doesn't provide us with a flag to define a password so you need to echo the password and pipe the output to the SaSchinvoke.exe command. There are lots of blogs on this but Rittman Mead's was the earliest I could find so I'll quote it here. The link is relatively old now but still useful as you could obviously integrate this script to any 3rd party ETL/scheduler tool like ODI. I'll break the script up for explanation purposes and then copy the full script at the end. Here is the first part of our script. At the top it sets a bunch of variables. It then runs our Region_Burst_Agent from the command line. Remember the agent writes our list of bursting regions to a text file. Notice the timeout at the end of the script. I've added this as we need to wait for the bursting definition file to be written before we move to the next step. I advise you to add better logic here and poll for the file to be written before going to the next step. REM Parse Region_Definition.txt file created by the Region_Burst_Definition agent. sqlcmd -S SERVER -d DATABASE -U USER -P PASSWORD -i "%SCRIPT_HOME%\update_region.sql"
With our default region set we can now call the Dashboard agent to write the dashboard to PDF. Notice again how I've put in a timeout to ensure that the dashboard is run and saved to PDF before we loop round to the next region in our Burst Definition file. I would recommend this polls for the file to be written before going to the next step. Here I rename the dashboard so it includes the location name. You can of course add a timestamp or anything else you want to with the name/location. echo F|xcopy /Y %BURST_SOURCE%\Sales_Dashboard.pdf "%BURST_OUTPUT%\Sales_Dashboard_%%i.pdf"
Once all the busting has completed the last step is to delete the file that contains our bursting definition. Here is the complete script. If you remove the commentary and variables there is only 14 lines of code. sqlcmd -S SERVER -d DATATBASE -U USERNAME -P PASSWORD -i "%SCRIPT_HOME%\update_region.sql"
Our Sales dashboard has been saved as PDF to our output location and burst across all the regions we defined in our Burst Definition report. Don't expect to burst out 1000 reports per minute; there is a delay when you launch an agent via Sachinvoke and you need to wait for the dashboard to be written before moving onto the next one. However you could use multiple users to run the process; using 2 user accounts could half the time. 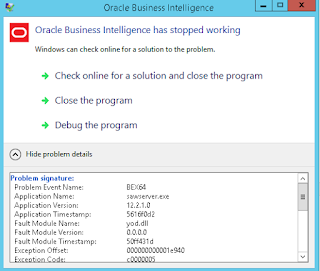 Remember, the object of this exercise is to burst our existing OBIEE dashboards, not to replace BI-Publisher. Am I happy with this? Yes and no. This is more complicated than it should be, it is not as fast as normal bursting methods and I have to hard-code passwords in the script (although arguably if someone is able to sniff around on your server you've got bigger issues than password protection). You can also have issues if agents start overlapping each other. However, you can only work with the tools at your disposal. This is easy to implement and extremely flexible with the output. You can add emailing to the loop, you could upload to Sharepoint...the options are endless. So there we have it. A more robust version of this script (error trapping, file polling etc) is currently running in a Production environment bursting up to a thousand reports daily and the customer is very happy with the result. Please feel free to post opinions, both good and bad. Maybe this will spark an idea for you to come up with a better idea? Share and let us let us know! Wouldn't it be easier to create an user for each region and run as recipient? Hi Mihai, you could do this. However, usually when you want to burst out reports you have many, sometimes 100s of bursting criteria (in our example regions) and it's unlikely that you will have a 1-to-1 mapping of an individual user for each region.